Download and install VyprVPN for Android onto your Android TV. Enter your login credentials and click Connect. That's it! Your android TV will be protected. You can also download the APK from the VyprVPN website and sideload the app to your Android TV device. What is the Best Way to Secure Your Android TV Box? A VPN encrypts your Internet connection and enhances your online privacy and security on your smart TV, like your Android TV box. When your TV is connected to the Internet, it may pose risks to your privacy like your computer does. These can include hackers or snoops viewing your activity, or your ISP or service provider collecting information about your viewing habits or behavior. 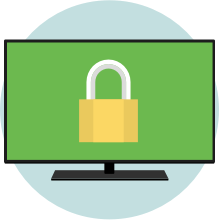 Using a VPN on your smart TV secures the connection greatly, enhancing privacy for the television. Using a VPN, like VyprVPN for Android TV, also provides other valuable benefits. It improves your streaming experience by offering enhanced speeds while you stream content, and defeats throttling performed by your ISP.